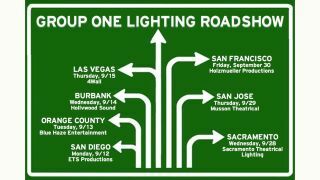 Avolites and elektraLite’s US distributor, Group One Ltd., is setting out on the second leg of its 2016 Lighting Roadshow, which will be stopping at seven dealer locations throughout California and Nevada during September. Offering hands-on demos of the two lighting brands’ newest tools and technologies, the tour will additionally showcase products from DTS Lighting. Roadshow open houses are free to the public and will run from noon to 4:00 p.m. RSVPs are encouraged, if possible, and can be made via: www.g1limited.com/roadshow Full catering will be provided for each stop of the tour. elektraLite: Bringing an entire collection of new products for customer evaluation, elektraLite will be showcasing its LED Ellipsoidal fixtures, DataAir wireless DMX system, two LED moving head fixtures and two more brand new lighting products that will make their official debut this fall, presented at these events in an exclusive special preview.